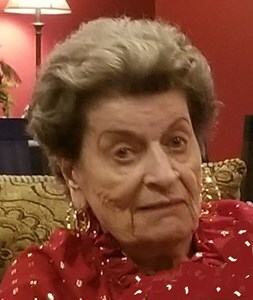 Christine Anne McKenna 80, of Olathe, KS (formerly of Ocala, FL) passed away on January 11th, 2019 at Gardens at Creekside. She was born on January 3rd, 1939 to John and Christina (Puff) Pupke in Jamaica, New York. On January 13th, 1957 she married Richard C. McKenna in New York, Christine and Richard lived in Valley Stream, NY for nearly 30 years before relocating to Ocala, FL. She was involved in many activities over the years, she was a member of the Red Hat Society in Ocala. She loved traveling and spending time with friends and family. Christine is survived by her sister, Carol (Pupke) Siniscalchi of Lindenhurst, NY, daughter, Jacqueline Perrine of Spring Hill, TN, her son Rick McKenna and wife Lori of Spring Hill, KS and daughter Meghann McKenna and Husband Stephen Merkel of Ocala, FL, 6 grandchildren and one great-grandson. She was preceded in death by her parents, husband and grandson (Adam Richardson). A committal service will be held at the Florida National Cemetery in Bushnell on Tuesday, January 22nd at 1 pm. Add your memories to the guest book of Christine McKenna. I knew Christine for almost 5 years when I was working at Gardens at Creekside. She was one of my favorites with her no nonsense personality and her straight shooting comments. I loved how she still wore her heels and refused to wear "old lady" shoes as she put it. She always made me laugh and I admired her spirit and independence. We joked about her hoarding, although her place always looked lovely and I enjoyed seeing what she was getting next from her QVC shopping habit. I had seen her several times since I quit working there and we always had big hugs and some laughs catching up. I will miss her and feel blessed to have had her in my life. My heartfelt condolences to her family. Christine was a unique gem. Our thoughts and prayers of comfort are with you and the rest of the family. We lose our loved ones and one day your loved ones will lose you but memories last forever. Cherish them. May God bless you all with memories in this time of celebration of life.